You can find a fax cover sheet template in the Excel templates. You can create the fax cover sheet template in a matter of minutes, and make it appear however way you want. 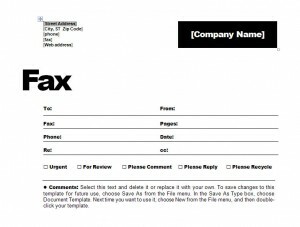 The first part of the fax cover sheet, you would add in the information needed. For Example, the name, email, phone and their fax, this would be blank until you need to fill it in. Then, you can use the Page Layout section and add various colors. You can also add pictures if you like. At that point, you would save it as a template, and reopen as needed.